North Penn pinch hitter Dan Drop made his chance count Thursday afternoon. Drop laced a fifth inning, two-run double to left field that increased North Penn’s lead from two to four, giving the Knights some breathing room in a 7-3 Suburban One League Continental Conference win over Pennridge. Drop personified the North Penn offensive approach all day against Pennridge pitcher Andrew Mayhew. The Knights put the ball in play and made the Rams get them out. That wasn’t always the case. Pennridge was able to score an unearned run in the top of the first behind a Kyle Yoder single. Yoder finished the game 2-for-3 with a sacrifice fly and two RBIs in the game. The lead was short lived however, as North Penn struck right back with three runs in the bottom — two unearned — thanks to an error, a wild pitch, and a Zack Miles RBI single. Among the clutch hits was a two-strike RBI single from Joey Picozzi in the first inning. Corey Stouffer also delivered with a two-out RBI single in the sixth, extending the lead to 6-2. Stouffer finished the game 2-for-4 with two RBIs and a run scored. Ryan Bealer was also strong offensively, going 2-for-4 with a double and a pair of runs scored. Mayhew finished the game with 90 pitches in five innings allowing six runs — three earned. 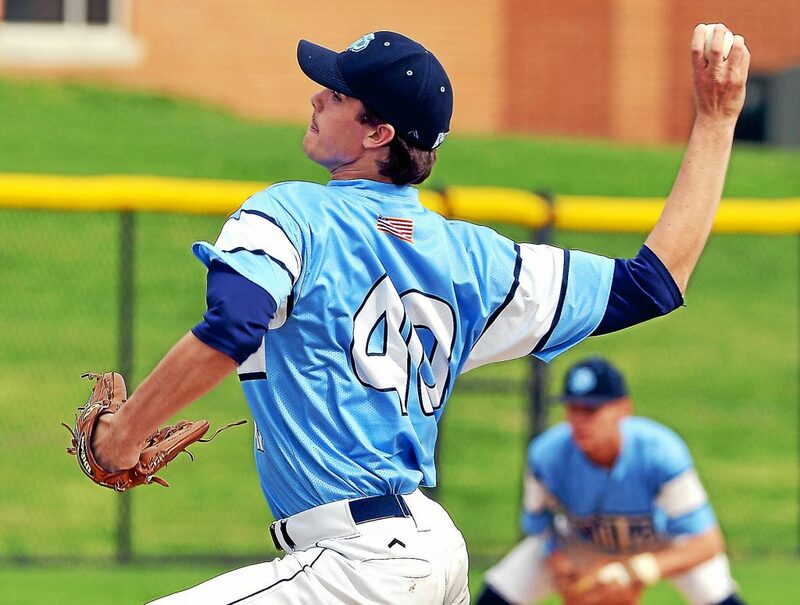 Matt Stevenson started on the mound for North Penn. He pitched 4 1/3 innings and allowed a pair of Pennridge runs to score, neither of them earned. The big right-hander did walk four batters, but he also struck out six and was overpowering when he found the zone. “He needs to throw fewer pitches, he had too many three-ball counts today,” Manero said about his starter. “He’s a big, tall kid so it’s a matter of getting a consistent release point. That’s what we’re trying to work on right now. Stevenson worked his way out of jams in the first and third with minimal damage before being lifted for Allen Vuong in the fifth. Vuong worked out of that jam, pitched a clean sixth, and then loaded the bases with no one out in the seventh due to a pair of errors —one on Vuong — and a hit batsman. Ricky Henning shut the door with a sac fly and a 4-6-3 double play to end it. North Penn improves to 10-1 on the season, and 4-1 in a mashed-up SOL Continental. Everyone is still in the race, but the Knights now sit at the top. 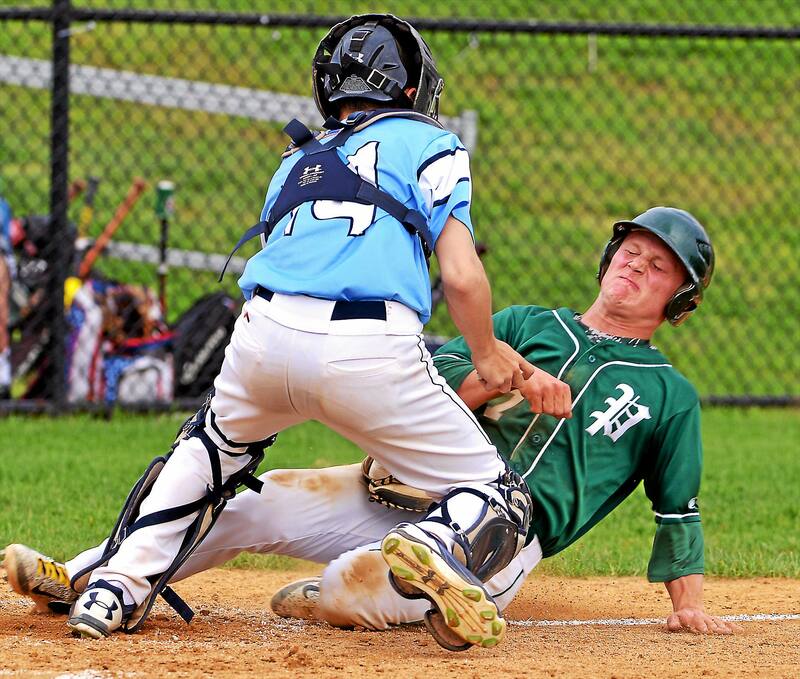 North Penn hopes to continue playing good baseball Friday against Central Bucks East. WP: Matt Stevenson 4.1 IP 5H 2R 0ER 4BB 6SO – 85 pitches. LP: Andrew Mayhew 5 IP 8H 6R 3ER 2BB 1SO – 90 pitches. 2B: NP-Stouffer, Bealer, Collins, Drop. Pennridge: K. Yoder 2-3, 2 RBI, SF; Robinson 2-2, R, 2 BB; Fantaskey 1-4, 2 R.
North Penn: Bealer 2-4, 2 R; Miles 2-4, R, RBI; Stouffer 2-4, 2 RBI, R; Collins 2-4, R; Drop 1-1, 2 RBI.